In this July 2, 2014 photo, Director of Documentation Center of Cambodia Youk Chhang holds Poch Younly's dairy book during an interview with the Associated Press, in Phnom Penh. 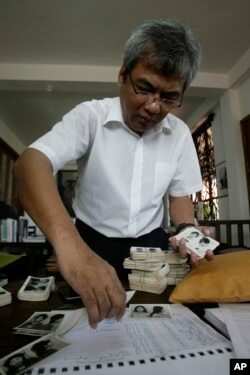 Editor’s note: Youk Chhang is the executive director of the Documentation Center of Cambodia. His organization, which has for many years documented the atrocities of the Khmer Rouge, has been key to the functioning of the Khmer Rouge tribunal. Below is an essay he wrote recently to mark international Holocaust Remembrance Day. On Nov. 1, 2005, the United Nations General Assembly designated Jan. 27 as international Holocaust Remembrance Day. The day is significant because it not only honors the victims of the Holocaust but it also calls attention to the world community’s resolve to not let such horrific events be forgotten. However, we would be mindful to note that one day of acknowledgment does not necessarily equate to a lifetime of respect, and the sincerity of gestures can never replace the substance of actions. We must ensure that our passion for humanitarian principles translates into a sincere compassion for the individual human being, and our commitment to remembering the past is measured not by our knowledge of the trite, but our appreciation for the individual human story. It is in this spirit that I relate to you a story that is deeply personal but nevertheless representative of the struggle that many Cambodians still face today. Just recently my sister Keo Kolthida Ekkasakh, or Kol, passed away, after a long struggle with cancer. She was born in 1959 in Phnom Penh to my mother, Keo Nann. Kol was deaf, and as the youngest of five sisters, she was two years apart from me, so we were like best friends. Lacking the ability to communicate with all but those trained in sign language, she learned to depend on herself and the few people who had the patience and love to know her. Yet, despite her circumstances, she had an incredible spirit and a personality that could light up a room. When the Khmer Rouge took control of Cambodia in 1975, I lost contact with her, and while we re-connected after the fall of the regime, both of us had already forgotten much of our sign language. Over the years our ability to communicate decreased, and it was not until last year that I began spending a great deal of time with her. We discussed the death and disappearance of loved ones and her experiences during the Khmer Rouge regime. Like many Cambodians during this time, she worked in the fields, planting vegetables and clearing forest. Like all victims, she learned to survive by sheer instinct: eating roots, leaves and insects to forestall starvation. I was amazed by the description of her experiences, and I was awed by the indescribable spirit and resourcefulness she must have had to survive as a deaf person during this atrocious period. The time I spent with her in the last year meant so much to me, and it was why in her final days, I prayed for a miracle in her health. But, like many Cambodians who suffer dire medical circumstances, she was at the mercy of an under-developed medical system, in which inefficient and unethical practices persist, as much as technological shortcomings. I spent many days and nights and weeks without sleep, supervising her medical care and waking medical staff during the night to ensure her proper treatment. Lacking immediate incentive or a more professional responsibility to a patient’s care, medical staff are often lax in their duties, particularly when the patient is poor. While in most modern medical systems, the patient's wellbeing is of paramount concern, in Cambodia it is the certainty of payment and thereafter the prospect for additional gratuities that guarantee quality of care. Such a system fails the impoverished, and it does a disservice to the generation that suffered so greatly to preserve a country in the wake of the Khmer Rouge. My sister died on Jan. 19 2015, but she did not die without a fight. On Jan. 13, nearly a week prior, she was pronounced dead by her doctors. Her vital signs appeared to have stopped, and she seemed to have no life. The doctors pronounced her dead and had we not thought different, she would have been cremated alive. Upon the doctor's advice we sadly took her to the Wat Langka pagoda, but rather than cremating her, we prayed. 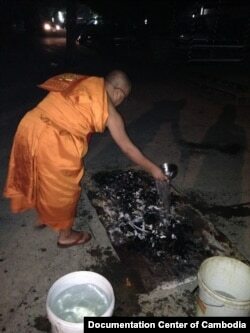 We prayed and the monks chanted and burned incense. We prayed over her body for hours and at one point a monk, Venerable Sao Chanthol, noticed tears on the side of her right cheek. She began to move her arms and open her eyes. I immediately showed her drawings of her memory for the American deaf researcher Erin Moriarty Harrelson. If miracles happen, then one occurred that evening. My sister lived for another week. She told us how she saw everyone who she knew in life and who died during the Khmer Rouge regime. She met my father, sister and neighbor—all who died during this time period. My sister survived (and thrived) for another week but then abruptly passed on the evening of Jan. 19. I wish there was more that I could have done to comfort her, just like I wish there is more that I could do for victims of the Khmer Rouge. Cambodia continues to struggle to this day with the history of this period. While we often look to politics, education and religion as the prominent fields that harbor the residual effects of this horrific period, the medical system as well bears this period’s scars. While all societies struggle with improving their respective medical systems, I don't believe my sister’s circumstances were isolated or unique. Had we not been at her side imploring the consistent attention to her care or inquiring into, with secondary medical opinion, her actual condition, I question how long she may have truly lived. The cool indifference to the poor or the casual triaging of medical care based on economic circumstance disguise a deeper sentiment than mere distraction, incompetence or laziness. The vestiges of horrific regimes can often reside in our own understanding, empathy and concern for our fellow human beings, in casual interactions as much as in professional services, and it is in this light that Cambodia still has much more to do. Indeed, our recognition for victims does not begin and end with one day; rather, we should mark this day as a symbolic gesture that our responsibility is not forgotten and we will do more. Youk Chhang is the executive director of the Documentation Center of Cambodia. His organization, which has for many years documented the atrocities of the Khmer Rouge, has been key to the functioning of the Khmer Rouge tribunal.